THREE MAN ARMY-THREE MAN ARMY AND THREE MAN ARMY TWO. All too often, a truly talented group fails to find the audience their music deserves.As a result, the band only releases a few albums, which are cherished by discerning record buyers. That was the case with Three Man Army, which was founded by brothers Adrian and Paul Gurvitz in 1971. Their new group released just a trio of albums between 1971 and 1974. 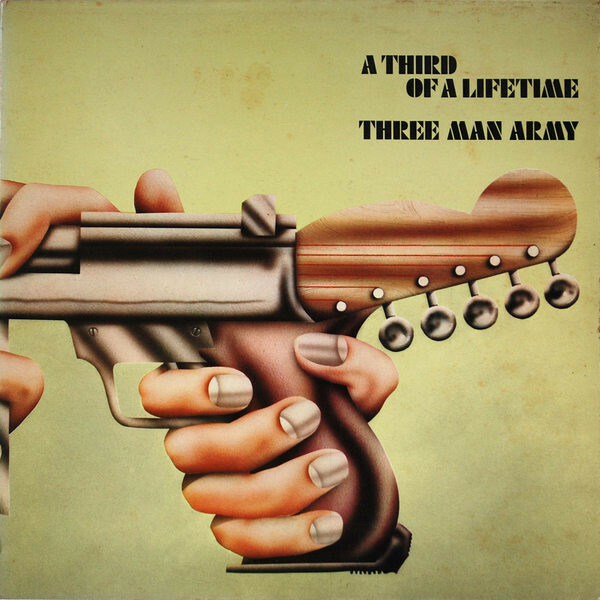 Later in 1971, Three Man Army released their debut album, A Third Af A Lifetime in 1971. It was followed by Three Man Army in 1973, and 1974s Three Man Army Two. Sadly, this proved to be Three Man Army’s swan-song. A fourth Three Man Army was planned but was never recorded. Instead, the band split-up. 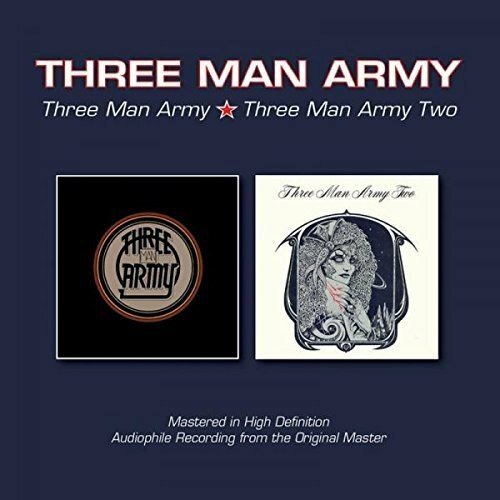 Forty-two years after Three Man Army released their final album, BGO Records have reissued a digitally remeasured versions of Three Man Army and Three Man Army Two on one CD. This reissue is a reminder of a British rock group, who should’ve reached greater heights, Three Man Army. Their roots can be traced to 1968. That was when Adrian Gurvitz joined his brother Paul’s group, The Gun. The group had been founded in 1966, and was originally called The Knack. However, in 1967 The Knack changed its name to The Gun. This wasn’t the only change that was about to be made. Soon, The Gun downsized to a trio, featuring drummer Louie Farrell, bassist Paul Gurvitz and Adrian Gurvitz on lead guitar and vocals. The change in name resulted in a change in fortune for The Gun. Theu signed to CBS Records in early 1968, and soon, began work on their eponymous debut album. Once it was complete, The Gun was ready for release. It featured The Gun’s best known song, Race With The Devil. In October 1968, Race With The Devil was released a single. It reached number ten in Britain, thirty-five reached in Australia and number one in several European countries. For the followup, CBS Records chose Drives You Mad, which wasn’t on The Gun. This non album track was released as a single in 1969, but it didn’t enjoy the same commercial success as Race With The Devil. Despite this, they sent The Gun back into the studio in 1969. The Gun recorded ten songs which became their sophomore album, Gun Sight. It was released in 1969. So was the lead single from Gun Sight, Hobo. Alas, neither Gun Sight nor Hobo, enjoyed same commercial success as Race With The Devil. For The Gun, this was a huge disappointment. Their last two singles had failed commercially. Surely, two wouldn’t become three? When it came to releasing a followup to Hobo, CBS Records decided to release a non album chart, and settled on Runnin’ Wild. It was released later in 1969, but failed commercially. Two had become three, and time was running out for The Gun. They released their final single Long Hair Wild Man in 1970. It was a familiar story, with single failing to trouble the charts. Record buyers within the underground counter culture failed to connect with, or identify with The Gun. Their music passed record buyers by. However, Jimi Hendrix knew who The Gun were. At the Isle of Wight Festival in June 1969, Jimi Hendrix played a riff from Race With The Devil. This was a huge compliment to The Gun. Alas, they were about to become part of musical history. The Gun disbanded, and the brothers Gurvitz spent a while working on separate projects. After The Gun disbanded, Adrian Gurvitz began work on what was meant to be his debut solo album. Eventually, though, the album became Three Man Army’s 1971 debut album, A Third Af A Lifetime. Before that, Buddy Miles was asked Adrian Gurvitz to join The Buddy Miles Express, on their US tour. Having agreed to join The Buddy Miles Express, Adrian Gurvitz spent the best part of two years touring. Night after night, they played to huge audiences. Some nights, 50,000 came along to see The Buddy Miles Express. For Adrian Gurvitz this was the perfect showcase for his considerable skills as a guitarist. However, after two years on the road, the tour was over. What now for Adrian Gurvitz? Back home in Britain, Adrian Gurvitz was reunited with his brother Paul. They decided to form a new band, which they called Three Man Army. A Third Af A Lifetime. Having formed Three Man Army, Adrian and Paul Gurvitz began work on their debut album, A Third Af A Lifetime. This was the album that Adrian had been working on, before he headed out on tour with The Buddy Miles Express. For A Third Af A Lifetime, Adrian Gurvitz wrote eight of the ten songs as Adrian Curtis. (Curtis was Adrian’s middle name, and the name he used until later in his career). Adrian penned Another Day, A Third Af A Lifetime, Nice One, Three Man Army, Agent Man, See What I Took, Midnight and Together. He also cowrote Butter Queen with Keith Ellis and Daze with Lou Reizner. Even then, Adrian was the creative force behind Three Man Army. He wrote the album, and when the album was recorded, would dawn the role of lead vocalist and lead guitarist. With ten new songs penned, Three Man Army headed into the studio with producer Lou Reizner. There was only one problem, the Three Man Army didn’t have a permanent drummer. Spooky Tooth’s Mike Kelly was drafted in and played on nine tracks. He joined bassist Paul Gurvitz in the rhythm section. Meanwhile, Adrian laid down the guitar parts and sang the lead vocals. However, Three Man Army found themselves without a drummer to record Butter Queen. Fortunately, Buddy Miles was in Britain, and Adrian asked him if he could lay down the drum parts on Butter Queen. Not only did Buddy Miles do that, he also added bass on Nice One and organ Midnight. These were the finishing touches to A Third Af A Lifetime. It was released later in 1971. Before that, critics had their say on A Third Af A Lifetime. It was well received by critics, who regarded the album as a minor hard rocking classic, where classic rock and blues was fused with hard rock. Three Man Army was carrying on the tradition of sixties power trios, and doing so with style and aplomb.However, would Three Man Army’s debut album find favour with record buyers? When A Third Af A Lifetime was released by Pegasus later in 1971, Three Man Army’s debut album failed to find an audience. For the Gurvitz brothers, and especially Adrian who creatively, was the group’s driving force, this was a huge disappointment. They could only hope that Three Man Army’s luck would change next time around. Three Man Army’s luck changed when met drummer Tony Newman. He was a veteran of numerous groups, including the Rod Stewart Group and Sounds Incorporated. While they were quite different stylistically to Three Man Army, Tony Newman was a talented and versatile drummer. From the first time the Gurvitz brothers heard him play, they realised that he was the missing link in Three Man Army. Now that Three Man Army’s lineup was complete, work could begin on their sophomore album. The album would be Three Man Army’s debut for their new record companies. Three Man Army had recently signed recording contracts with Polydor in Britain and Reprise Records in America. With the commercial and marketing might of two of the biggest record companies in Britain and America, things were looking up for Three Man Army. All they had to do was write and record their sophomore album. Just like A Third Af A Lifetime, Adrian Gurvitz wrote most of their sophomore album, including Come On Down To Earth, Take Me Down From The Mountain and Can’t Leave The Summer, Parts 1 & 2. He teamed up with Lee Baxter Hayes Jr to write Take A Look At The Light. However, the addition of new drummer Tony Newman resulted in the formation of a new songwriting partnership. When Tony Newman joined Three Man Army, it soon became clear that he wasn’t just a talented and versatile drummer, but someone who would become Adrian Gurvitz’s new songwriter also partner.Together, they cowrote Hold On, Woman, Mahesha and Trip. The other track on Three Man Army was a cover of Jack Yellen and Lew Pollack’s My Yiddishe Mama. These songs were recorded at Morgan Studio, in London. Recording of Three Man Army took place during April of 1972. The new lineup of Three Man Army band had spent time honing their sound, and were ready to record their sophomore album. Producer Lou Reizner returned, but this time round, co-produced the album with Three Man Army. Their lineup featured drummer Tony Newman, bassist Paul Gurvitz and lead vocalist and guitarist Adrian Gurvitz, who also played organ. They recorded nine songs during April of 1972, and they would eventually become Three Man Army. There was time lag between Three Man Army completing their sophomore album, and its eventual released in 1973. In Britain, the album was released as Mahesha. Across the Atlantic, the album was released as Three Man Army. What critics on both sides of the Atlantic agreed on, was the quality of the music. Critics were won over by a soulful album of melodic, memorable and hard rocking music. Comparisons were drawn to Deep Purple, Black Sabbath and Led Zeppelin. Some critics saw Three Man Army as the natural successor to Cream. Especially given the consistency and quality of music on Three Man Army. Songs like the hard rocking Hold On and the anthemic Come On Down To Earth caught the attention of critics. So did Woman which features Three Man Army at their most melodic and soulful. Can’t Leave The Summer Parts 1 and 2 closed the album, and proved the perfect showcase for Three Man Army’s considerable talents and versatility. Especially vocalist and guitar virtuoso Adrian Gurvitz. He was the band’s shining light, and played a huge part in an an album that was hailed as minor classic by certain critics. However, they had said the same about A Third Af A Lifetime, and it had failed commercially. History repeated itself when Three Man Army was released in 1973. The album failed to chart in America, and didn’t find the audience it so richly deserved. Despite the disappointment this caused, Three Man Army regrouped and began work on their third album. Despite the disappointment of Three Man Army’s commercial failure, the band were determined to move forward. So Adrian Gurvitz began writing Three Man Army’s third album. He wrote Today, Flying, Space Is The Place. This time around, Adrian and Tony Newman cowrote just the one track, Irving. The pair joined with Paul Gurvitz to write Burning Angel. Adrian also renewed his songwriting partnership with Lee Baxter Hayes, and the pair penned Polecat Woman, I Can’t Make The Blind See and In My Eyes. These songs were recorded at Ramport Studios, in Battersea, London and would become Three Man Army Two. When recording of Three Man Army Two began, there had been a number of changes made. There was no sign of producer Lou Reizner. He had produced A Third Af A Lifetime and co-produced Three Man Army with the band. For Three Man Army Two. Three Man Army and Cyrano co-produced the album. It featured Three Man Army and a few friends. Just like Three Man Army, the lineup remained the same. Drummer and percussionist Tony Newman was joined in the rhythm section by Paul Gurvitz who also added acoustic guitar. Meanwhile, Adrian Gurvitz played lead guitar, slide guitar, organ and added lead vocals. Peter Robinson played piano on Space Is The Place and I Can’t Make The Blind See. It also featured backing vocals from Doris Troy, Ruby James and Madeline Bell. With a little help from their friends, Three Man Army recorded what became Three Man Army Two. 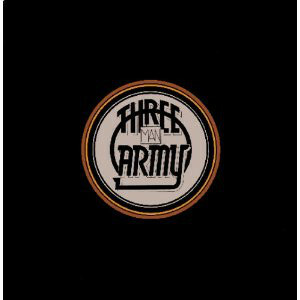 Casting around for a title, Three Man Army decided to call the album Three Man Army Two. Their reasoning, was that this was the second album from this lineup of the band. The album was delivered to Warners, who would release the album on Polydor in Britain and Reprise Records in America. Before that, critics had their say on Three Man Army Two. Just like their two previous albums, Three Man Army Two caught the imagination of critics. They were won over by the opening track Polecat Woman, which was heralded as one of Three Man Army’s finest hours. This was designed to whet the listen’s appetite as, Three Man Army Two unfolded. Today is rocky ballad Today, where elements of blues and psychedelia shine through. Then on Flying, Three Man Army kick loose, on this melodic rocky anthem. It gives way to Space Is The Place an orchestral ballad that references Pink Floyd. Irving is a blistering slice of heavy rock, while I Can’t Make The Blind See is an orchestral power ballad. Burning Angel finds Three Man Army seemingly pay homage to Led Zeppelin. In My Eyes is a blues rocker where Three Man Army bid the audience farewell on Three Man Army Two. Little did they realise it would be for good. 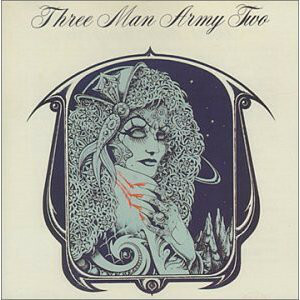 When Three Man Army Two was released in 1974, the album failed commercially. Just like their two previous albums, Three Man Army Two and its fusion of blues, psychedelia and rock passed record buyers by. Three Man Army were out of luck. Despite that, they planned to record a fourth album. That didn’t come to pass. Instead, Tony Newman got the chance to join David Bowie’s band. This was too good an opportunity to turn down. Three Man Army were to square one, and without a drummer. Before the search for a new drummer began, Adrian and Paul Gurvitze joined with Ginger Baker the Baker Gurvitz Army. They released a trio of studio albums between 1974 and 1976. The formation of Baker Gurvitz Army spelled the end of Three Man Army. Unlike many seventies rock groups, Three Man Army never reunited. Even when interest in their music began to grow. Three Man Army now have a cult following, who have discovered and appreciate Three Man Army’s three albums. They regard each of these albums as cult classics. That’s the case. Especially Three Man Army and Three Man Army Two which have been digitally remeasured and reissued on one CD by BGO Records. This is the perfect opportunity to discover, or rediscover one of British rock music’s best kept secrets, Three Man Army, who could’ve, and should’ve, become one of the giants of seventies rock. ← JOHN MILES-MORE THAN MUSIC.